The club was organized in 1915 and has its own rustic clubhouse at Lake Dawn near the entrance to the Olympic National Park. The club has over 150 members. 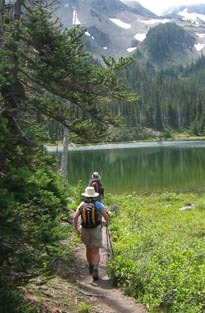 A typical hike attracts 6 to 20 hikers. We have monthly potluck meetings with guest speakers. We are focused on day-hiking but we also schedule a variety of backpacking trips in the Olympics each summer. Although active hikers average 60 years of age, anyone 18 or over is welcome to join. Day hikes range from 2-mile easy strolls to 16 miles in steep terrain.